We are running a Study Happy campaign next week (Monday 22nd October – Friday 26th October). This campaign is aimed at promoting a happier and healthier study experience for students. It is well known that one of the most important factors to be successful at University is your health and wellbeing, and sometimes we all need a little bit of a boost 😀. It is important to find a good balance between valuable time for yourself and time for study. This week we will be providing free healthy drinks💧, snacks🍎 and activities. There will be free healthy snacks and water and you can take a well-earned break from your studies by taking part in the following activities: mindful colouring, stay organised with a planner, wordsearches, mindmap revision tips and time management tips. These activities are a great opportunity for you to take a break and have fun, spending time developing new time management and organisational skills. We will also have a Study Happy Book Display on the ground floor of Catalyst, so spend some time seeing what literature is available to help you with your studies. 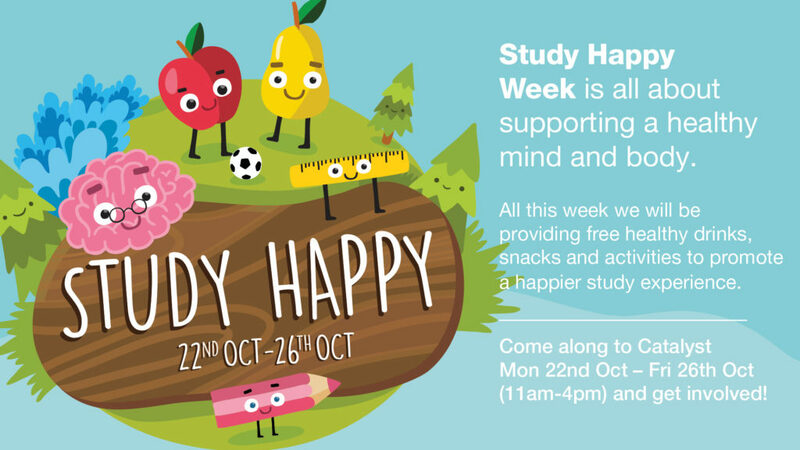 Come along to Catalyst (11am-4pm) Monday 22nd October – Friday 26th October and get involved with Study Happy week. This entry was posted in Learning Services by Laura Riella. Bookmark the permalink.